MRI of the lumbar spine. (A) In the sagittal T1-weighted MRI a lesion with signal intensity brighter than the CSF is seen filling the sagittal diameter of the spinal canal (arrow). (B) The lesions appear to be cystic and of high signal intensity (arrow) on the T2WI. (C) Axial T2WI MR of the same patient. A facet joint synovial cyst is seen within the right lateral recess bulging into the lateral recess and the intervertebral neural foramen. The proximity of the cyst to the facet joint is clearly demonstrated. and anti-inflammatory medication may be tried first. If the symptoms persist the cyst can be drained percutaneously. A needle is introduced into the cyst under fluoroscopy or guided by CT scan. Following drainage of the cyst's contents steroids can be injected into the cyst's cavity. This procedure can bring about symptom relief lasting for weeks, months, or, at times, longer periods of time. If no relief is obtained or when the symptoms recur, surgery should be considered. Total cyst excision is performed in order to prevent cyst recurrence. Spinal stabilization should be performed in patients with local instability. Most patients do well postoperatively. 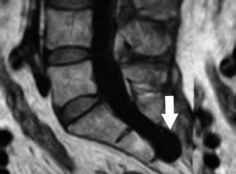 Tarlov cysts are commonly seen in MRI studies of the lumbosacral spine. The cysts were described by Tarlov in 1938 and bear his name. In most instances the cysts are an incidental finding, have no clinical relevance, and are not responsible for the patient's symptoms. In a small number of patients, especially those with large cysts, symptoms such as back pain, radicular pain, and pelvic pain may be caused by the cysts. Tarlov cysts are most frequently encountered in the sacral region, especially at the S2 and S3 levels (Figure 7-2). At times the cysts may occur in the lumbar region and less frequently in the thoracic region. The cysts usually develop at the junction of the dorsal root with the dorsal root ganglion in the space between the perineurium and the endoneurium. At times the nerve rootlets are embedded in the cyst's walls. It is postulated that the cysts are formed secondary to an inflammatory or degenerative process or local trauma. Not infrequently, multiple bilateral cysts resembling a cluster of grapes are formed. At times, the cysts attain a large diameter of several centimeters. Large cysts, especially those with a valve-like mechanism that may lead to gravitational fluid accumulation, may cause sacral ectasia, enlarge the neural foramen, and, at times, lead to a pathological fracture. It is very difficult to decide what role, if any, the cyst plays in the patient's symptomatology. In most patients other coexisting pathology is the likely cause of the symptoms. Several small series of patients have been described where surgery dealing with other pathology, such as disc, facet arthropathy, or spinal stenosis, has been performed, while the cyst was left untouched. In many instances all the symptoms subsided. Rarely, sacral, perineal, and radicular pain or compromised bladder and bowel function may be caused by large cysts. In the absence of other significant pathology, surgery should be considered. 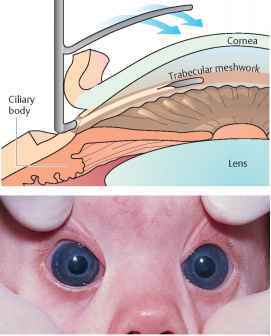 The cysts should be decompressed and their content aspirated. As nerve fibers are frequently embedded within the cyst's wall, it is not surprising that some patients can be left with neurological deficits following excision.